1-Device Universal Remote Control for TV only. • Optional security cable attachment available (CBL01). INPUT/DASH key - This key works for sub-channels (-/.) only when pressing number keys first in a sequence. example 12.2. Pressing keys , , [-], . If pressing the Dash key on its own, then it will send command for INPUT. The replacement for original ANDERIC RR1H Hospitality Remote Control is in-stock and ships within 24 hours. 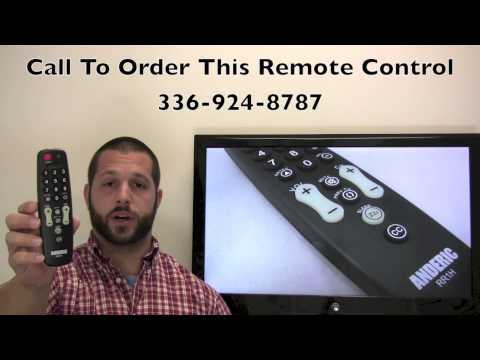 The replacement for original ANDERIC RR1H Hospitality Remote Control carries a 1-Year Warranty. RR1H is discontinued and replaced by the newly upgraded RRH100 (same remote but with more codes)! Basic-function remote features a limited selection of over sized buttons, perfect for situations requiring simplified control of a television only. By removing buttons like the MENU button and all other functions for the DVD players, cable or satellite boxes, standard functions are much easier to access. With added security by attaching the optional cable attachment; rest assure, your investments are protected. Perfect for televisions located in public areas, or in environments where the sets are operated by children or elderly. We bought these to replace the standard remotes that come with the large TV sets we install in classrooms and learning spaces. We do not want users to be able to access the TV settings or smart TV functions. This has been a brilliant, low-cost solution. We also use the tethers and a strip of velcro to secure the remote. A great product. by Nick on April 22, 2015. Would recommend Replacementremote.com to anyone! by Anonymous on April 19, 2015.
by Anonymous on September 07, 2013. Received the remotes in a timely manner. Easy to set up. by Marsha on October 04, 2017. The Anderic RR1H is working great with our 200 Lg LED Tv's. by Terry on June 06, 2016.
by Alka on June 01, 2016.
by Mike on May 23, 2016. We have ordered hundreds of these remotes (ANDERIC) over the years from replacementremotes - always a winner!!! D.M.I. by DON on May 16, 2016. It great for someone who just needs simplicity. by Anonymous on February 10, 2015. Have a motel with several TVs. by Anonymous on February 06, 2015. Used on A Vizio TV. Worked right out of package. by Anonymous on November 02, 2014. Resort. Lose many to people carrying them off. by Anonymous on August 13, 2014.
by Anonymous on March 26, 2014. Good for hospitality, or health club, or anywhere you need TV remotes that tend to walk away. Bears usually are to blame.. cause they like the colours of the buttons when the light up... and their chewy too. by Anonymous on March 24, 2014. We got new tv's for our motel, and we sent in 25 originals, and got 50 of these for free. This is a wonderful deal. They are excellent because the guests cannot change settings. Before we use to have lots of problems with people pressing the code search button, and it would reset the remote. These remotes solve that problem for us. We are using magnavox tv's and the remotes worked out of the box. No programming needed. Good quality, good service reps at this company. by Dennis on January 10, 2014. These remotes are used in our motel rooms. Have not had the chance to use them yet. by Anonymous on December 16, 2013. Great product, Perfect for Hotels. This is the last model you will search for. It is the best for hospitality rooms. by Anonymous on July 10, 2013.
by Anonymous on June 10, 2013.
by Anonymous on April 24, 2013. Could not use the remote due to our cable TV setup, but the design and quality are great. by Anonymous on March 22, 2013.
by Anonymous on May 02, 2013.